In all ages, when astronomy has been cultivated, the opinion seems to have been entertained ... that the regions around us, beyond our atmosphere, and to an indefinite extent, are supplied with a rare, invisible medium, of unknown composition and character ... To this substance the name of ether has usually been applied." "Naturally such a man could not accept the geology of the Old Testament and as his dissent was bluntly expressed, many persons thought him a 'dangerous' character ... But back in 1830, when the cholera ravaged the town, no other man so gave himself and all his time and strength to nursing the friendless ... A miserable vagabond when stricken with the plague was left alone in a deserted tenement. Haskins sought him out, carried him in his arms to a wagon and put him in the hospital. He and Loring Pierce, the undertaker, were the heroes of this terrible episode. If R. W. Haskins did not believe that the whale swallowed Jonah, and was not sound on the natural science of Genesis, nevertheless, he was the best Christian of them all when the time came that tried men's souls." This, then, was the rebel who took on the æther theory in an article entitled Examination of the Theory of a Resisting Medium, in which it is assumed that the Planets and Comets of our System are moved, [American Journal of Science 33, 1 (1838)]. Haskins begins by reviewing very ancient and even mythological versions of æther: the waters above the heavens; the Hindu akasha; even the celestial ocean (complete with dolphins in the form of animate comets) once suggested by Kepler ("in framing some of the absurd theories which he put forth, along with his immortal discoveries"). Having traced this alarming intellectual pedigree, he turns to the more rational-sounding but long disproved Cartesian theory that gravity arises from whirlpools in the cosmic medium, a theory whose rejection he describes as making the learned world "sane". Even Newton, on the subject of æther, appears more in alchemical than rationalistic mode, writing in the very last paragraph of the Principia: "And now we might add something concerning a certain most subtle Spirit which pervades and lies hid in all gross bodies; by the force and action of which Spirit the particles of bodies mutually attract ..."
Haskins's cunning is evident: only after proving that æther theories were tainted with irrationality a mere "one hundred and seventeen years" before does he turn to more modern opinion. But he does so at last. In 1762 Abbé Bossut wrote a prize-winning paper predicting the decay of planetary orbits due to æther-resistance and claiming to show such decay from actual data in the case of the Moon. This became one of the two pillars of æther theory as it existed in Haskins's time, the other being the hypothesis of Alexandre Guy Pingré relating the direction of comet tails to the resistance of the interplanetary medium. The case of Encke's Comet, with its highly-perturbed short-period orbit and bizarre behaviour, seemed to offer a particularly clear illustration of the æther-drag effect in action. Most Nineteenth-Century thinkers were convinced: John Herschel, Mary Somerville, William Whewell. It was an argument with serious, literally eschatological, consequences: it led inevitably to "the destruction of the solar system, through the agency of this ether," albeit in distant times to come. Haskins, with his technological optimism and futureward orientation, could not accept this bleak prognosis: he preferred to think that the planets "constitute, in the sublime language of Pontécoulant, 'immense pendulums of eternity, which beat the ages as ours do the seconds!'" To defend the stability of the solar system against the æthereal peril required only a close reading of the literature. Are the orbits of the heavenly bodies indeed decaying, or could the data seeming to indicate this be flawed? Even if the decay is real there could be other explanations: tidal forces; errors in estimating the masses of astronomical objects; undiscovered planets beyond Uranus; the failure of mathematicians to solve exactly the few-body problem, much less the many-body problem of the real solar-system. And is it not odd that, while some comets appear to be acquiring shorter periods, a few do just the opposite, and all exhibit quite different rates of change? On the subject of comets: should not æther drag cause their tails to point along their trajectories, rather than opposite the sun? What about comets with two, differently-oriented tails? Certainly the behaviour of comet tails is complicated (and Haskins wanders off into irrelevant digressions about whether comet tails really do point away from the sun, and whether light can exert pressure), but charting their orientation with the accuracy possible in 1838 provides little evidence of a resisting medium. He concludes: "[W]e have shown that the existence of this ethereal medium was for a long series of years believed in, without evidence ... that it has been, during another long series of years, even to the present day, accredited, also, upon different points of evidence ... but all which evidence has failed to sustain the fact of its existence ... [N]ot that its existence has been disproved; but only that confirmatory evidence of that existence no longer remains. The predictions, therefore, that have pointed at the destruction of the solar system ... may very well be discarded." From a Twenty-first Century vantage point, Haskins is largely correct. The alternative explanations which he adduces for the evidence cited by the æther theorists are, in many cases, the standard explanations given today. The solar system is still generally thought to be unstable, but not primarily because of a resisting medium. The very word "æther" seems so dated (and so poisoned by association with anti-relativity cranks) that periodic reintroductions of the concept into modern physics almost invariably come under the disguise of some new terminology. Why, then, is Haskins so obscure, both in our time and in his own? The explanation is simple: even as he wrote, æther theory was undergoing a major revolution. The resisting æther attacked by Haskins is not the luminiferous æther, the medium on which light waves (supposedly) travel like waves on the ocean. The wave theory of light, after a long exile from intellectual respectability, returned in triumph around 1830. With it came a new science of æther, with its own problems (entrainment of æther by moving bodies; aberration of starlight; electromagnetism; the speed of light ...) and little concern for the astronomical issues addressed by Haskins. Not once in his essay does he mention these new developments, although he must have been aware of them. He does not even take on older æther-optics, which is curious: in the passage which Haskins quoted from the Principia, Newton actually mentions the possible role of the æther in explaining the reflexion and refraxion of light. What a missed opportunity! One can easily imagine an alternate course of history: an ex-bookseller in Buffalo thinking of the cars on the new iron-railway to Albany going faster and faster, to the speed of light, and what would be the time registered by the clocks on board those cars ... ? If only the Bump of Invention had been ever so slightly larger! "Well, says a certain class of readers, what new proofs have you to offer in support of the truths of phrenology? None, whatsoever, is our ready response; for none are necessary. 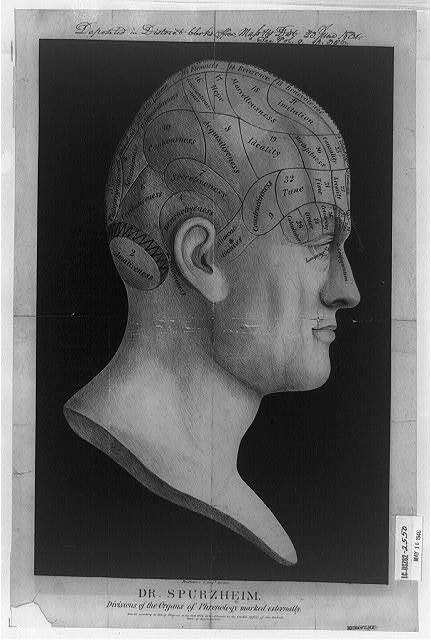 We consider the fundamental principles of phrenology as well settled and demonstrated as are the great truths in chymistry, geology, astronomy, &c." -- R. W. Haskins, History and Progress of Phrenology, 1839.